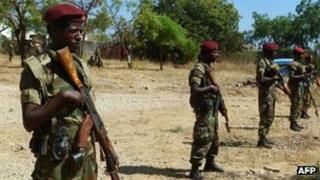 Ethiopian forces have launched a military assault on positions inside Eritrea, Ethiopian officials have said. Ethiopia attacked because Eritrea was training "subversive groups" to carry out attacks inside Ethiopia, a government spokesman said. A number of people were killed and others captured when three camps were attacked, a defence official said. Eritrea has not yet commented. The two countries fought a border war from 1998 to 2000. Despite signing a peace treaty, tensions between the two countries have remained high ever since. However, Thursday's dawn raid is the first attack by Ethiopian troops inside Eritrean territory since the end of the war, in which some 80,000 people died. The United States has called on both countries to "exercise restraint and to avoid any further military action". In recent weeks Addis Ababa has accused Eritrea of backing Ethiopian rebels who staged a January raid in the northern Afar region that killed five Western tourists. Two German nationals were taken hostage during that attack but were later released. Ethiopian government spokesman Shimeles Kemal said the army units involved had returned to camp after "successfully completing" their mission. He claimed Eritrea is harbouring "hit-and-run terrorists", and he warned of further possible operations. "As long as Eritrea remains a launching pad for attacks against Ethiopia, similar measures will continue to be taken," he said. Ethiopia is also engaged in military operations in neighbouring Somalia, where it is fighting the Islamist al-Shabab group. Eritrea denies accusations that it backs al-Shabab. Eritrea was annexed by Ethiopia in 1962 but gained independence in 1993 after a 30-year guerrilla war.